Electric blues meets bebop and contemporary influences to create an exciting convergence of sounds, which has made Randy Johnston one of the hottest jazz guitarists and composers both in the United States and abroad. The key to his appeal is how successfully he blends various inspirations to create a fiery jazz/blues style that reaches both the head and heart. 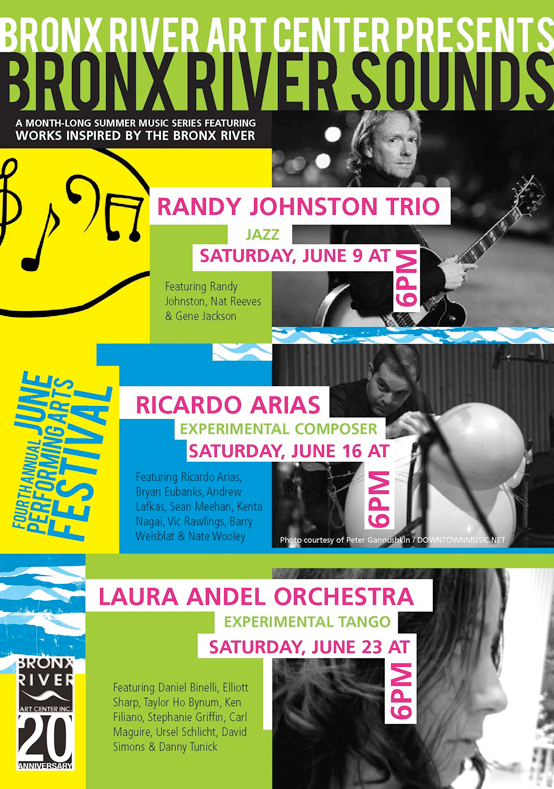 Randy’s new composition consists of a suite of jazz tunes that draw inspiration from world events, as well as personal impressions of life in New York, the USA, and the Bronx. He has assembled a trio that includes bass player Nat Reeves and drummer Gene Jackson. Ricardo Arias was born in Bogotà, Colombia, in 1965. He has also lived in Barcelona, The Hague, and he currently resides in New York. Most of Arias's music is improvised and made in collaboration with other musicians. Apart from occasionally playing the flute, he uses unconventional instruments and found objects as sound sources. Since 1992, he has focused almost exclusively on The Balloon Kit, a number of rubber balloons attached to a suitable structure and played with the hands and a set of accessories, including various kinds of sponges, pieces of Styrofoam, and rubber bands. For his composition "Trying and Erring", created for BRAC, he has brought together a unique group of musicians, each of whom have developed idiosyncratic ways of approaching their instruments, and of understanding and organizing sounds. Although their music is highly personal, they work collaboratively to create music and experiment with sound. The ensemble includes Bryan Eubanks, Andrew Lafkas, Sean Meehan, Kenta Nagai, Vic Rawlings, Barry Weisblat, and Nate Wooley. 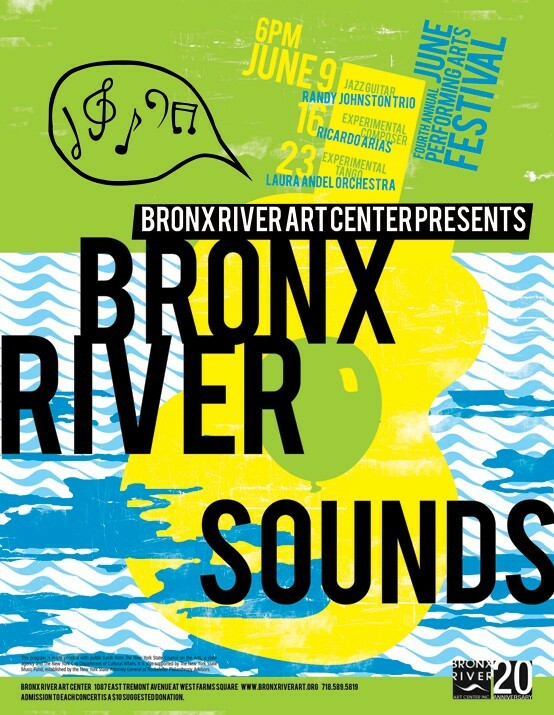 New York-based, Argentinean composer and conductor Laura Andel premieres a newly-commissioned work by Bronx River Art Center for her nine-piece orchestra, comprised of an unusually eclectic instrumentation that includes bandoneon, gamelan instruments, electric guitar, Fender Rhodes, vibraphone, cornet, viola, clarinets, piano, and double bass. The Laura Andel Orchestra includes long-time collaborators and unique musicians Taylor Ho Bynum, Ken Filiano, Stephanie Griffin, Carl Maguire, Ursel Schlicht, David Simons, and Danny Tunick, and for this BRAC performance, the special participation of Argentinean Tango bandoneon player Daniel Binelli and New York experimental electric guitarist Elliott Sharp. By writing scores that pull from her native Tango and balance composition, textural improvisation, and compositional conducting, Andel and her ensemble create unique sonic landscapes, built from musical elements from avant-garde jazz to contemporary classical. In addition to the BRAC premiere, the orchestra will perform another recently created work titled Doble Mano. *Doble Mano was funded in part by the Composer Assistance Program of the American Music Center, and was partially developed during a residency at The Rockefeller Foundation / Bellagio Study Center, in Italy, and at Blue Mountain Center in New York. Admission to each concert is a $10 suggested donation.